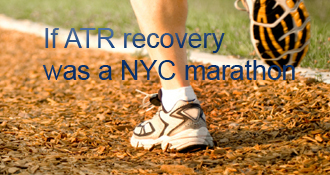 juan63 has completed the grueling 26.2 ATR miles to full recovery! juan63 on I got the BOOT! franticachilles on I got the BOOT! normofthenorth on I got the BOOT! Well, I’m 3 weeks post-op as of yesterday. I’m PWB and am still pretty much without pain or much swelling. That’s a good thing of course! I started some chair cardio as well as some upper body workouts on Monday and I can’t describe how awesome it feels to be active again. Chair cardio’s actually not too bad, you’re arms just get really tired. I’ve been progressively more mobile which is so much better than being laid out on the couch with my foot in the elevated position that we all so love. Had my appointment with the doctor and had my stitches removed. My incision was a little moist due to too much perspiration in the splint so got told not to get it wet for another week. Other than that, everything seems to be going well. I switched out my splint for a Bledsoe Achilles Boot, it’s a type of Cam Walker Boot, not the VACOcast boot I was hoping for that everyone says is so great. The doctor set the boot up with two 10 degree wedges and showed me how to take it on and off. It’s actually not bad at all as far as comfort goes, just have to get used to the heaviness/bulkiness. But of course, I have nothing to compare it to. Now, what the doctor said next was a little surprising compared to the structured recovery timelines I’ve been reading about on this site. He basically told me it was up to me to put as much weight as I could tolerate on my injured foot and to remove the last 2 wedges as pain allowed. He reassured me that my AT was safe as long as my foot was secured in the boot and that I didn’t need to worry about hurting it. He then gave me a remedy to treat the upcoming swelling, told me to come back in 2 weeks and sent me on my way. Oh, got cleared to go back to work on limited duty for 8 hours a day too, yay! That was it, no recovery timeline and no advice as far as what ROM exercises I’m supposed to do. Maybe the lack of instructions is because my doctor/surgeon is my golfing buddy and because of my lack of asking questions. Probably because I’m always texting him and asking questions. It’s a good thing that so much info is provided on this site about timelines and ROM exercises or I would be totally lost. My plan is to get full weight bearing by the end of week 4 and to hopefully remove one of the last two wedges by my 5 week post-op appointment. This will hopefully get me on pace to be in 2 shoes by week 7/8 which is where it seems most people are making that transition. I think this seems reasonable and not too aggressive compared to other recovery timelines I’ve seen. Any thoughts or suggestions on my makeshift recovery timeline? Also, is there anyone out there that has used or is currently using the same Bledsoe boot that I have? Any info or tips about the boot would be much appreciated. Thanks to all for your advice and I hope everyone is recovering well! I’m 2 weeks post op tomorrow and haven’t really experienced any pain since about 5 days after surgery. I’ve now been elevating my foot pretty much all day since I sustained my ATR. The blood rush to my foot when crutch’n around has gradually tapered off daily and only a small amount remains at this point. For some reason, my foot has started to fall asleep and gets really warm when elevating it today. Not totally asleep but feels like it wants to get to that point at times. I can also feel slight pain in my AT at the incision cite but not much. I want to think that this is normal at this point but I have no idea. Just like everyone else, I get concerned and worried when something different happens. Has anyone else experienced this? If so, how long did it last? Well , it’s been about 1 week since surgery and I’m finally getting some energy back. Sure wish I had 2 good feet to go for a run but that’s gonna have to wait awhile. At this point of my recovery, I’m glad to say that there’s virtually no pain in my AT area and I’m completely off of pain medication. Its so nice not being so tired from the meds. I am taking some flexeril for constant muscle spasms that seem to just show up at night. Without this medication, the muscle spasms cause some pain to my AT and keep me from much needed sleep. Had my 1st post op appointment with my doctor on Thursday. Doctor said my incision is healing well and everything looks good. He hooked me up with a new splint and bandages and told me to come back in 2 weeks to get my stitches removed. Then I’ll be fit for my VACOcast Achilles Pro boot, Can’t wait! Sure will be nice to crutch around with a boot opposed to this splint that pretty much offers no protection. Yesterday was the 1st day I was really mobile other than the short trip from the bedroom to the living room. I even tried to help out around the house a little while the wife was at work and the kids were at school. In order to gain the use of my hands again, I lost the crutches and used a small desk chair with wheels to get around the kitchen. Emptied the dishwasher and made the family my 1st dinner since my injury. Wow, what a great feeling it was to contribute a little. Thanks to those who have commented to my last post. I’ve figured out how to create new posts but haven’t quite figured out how to respond individually to the people who have replied to my previous posts. I hope everyone is recovering well and I wish everyone the best. My name is Juan and unlike most people that I’ve read about in this blog, I actually tore my left AT while at work. I’m 33 years old, had surgery on 2-27-14 and am 4 days post op. I’m in law enforcement and work in California. On 2-14-14, I responded to a DUI collision scene where an SUV was blocking a lane on the highway. The SUV had front end damage and was disabled in position beside a guardrail where I couldn’t use the push bumper on my patrol vehicle to move it. In order to make the scene safer, I went to the front of the SUV and attempted to push it out of the road. I leaned forward with both hands on the hood of the SUV and pushed. The SUV didn’t move very much so I leaned further forward and placed my left foot back for leverage and then pop! I actually heard it pop, looked back and thought that my boot had slipped on the asphalt roadway. Once realizing that my foot was in the same place and my ankle was starting to get very warm, I knew that I had injured my AT. Moments later another officer arrived to assist me and helped me hop back to my patrol vehicle where I waited for an ambulance. “That’s when the pain set in and it was the Longest 10 minutes of my life.” I was transported to the hospital where I spent the next 2 night and was eventually sent home with a splint and some very uncomfortable crutches. I then spent the next days crutch’n it around on my much more convenient/comfy mobileg (mobilegs.com) crutches that I purchased until surgery. Surgery was at 10:30am and was a piece of cake until my nerve block wore off at about 11:00pm that evening. It lasted about 12 hours just as the anesthesiologist had said. This is when I experienced the worst pain ever. The Norco that I had been prescribed wasn’t cutting it and I tried to suffer through it until about 2:00am and that’s when my wife called the on-call doctor who ended up being my doctor/surgeon. Then it was off to the ER where I got an injection of dilaudid that took most of my discomfort away. By this time my temp was over 101 degrees, I was sweating and I could not stay still. After about 4 hours in the ER, I went back home and my doctor gave me a script for Percocet later that morning. The Percocet took care of all the pain and allowed me to finally go to sleep. Since then I’ve been posted up on my bed like everyone else, spending my days watching tv, reading and surfing the net. Been taking my Norco during the day for pain and Percocet at night to sleep ever since surgery. Most of the major pain has subsided as of now and I’ve been trying to stop taking my meds. Can’t wait until my first post op doctors appointment on 3-6-14 to hopefully hear good news that my incision is healing well and that I’ll get my VACOcast Pro Achilles boot at week 3 as planned. As always, thanks for your input and advice. My Bledsoe boot does not have any fancy dials, hinges or air bladders. It’s just the base model but I’ve seen the one you’re talking about on their website. I will implement your advice about wearing the boot at night when removing a wedge when the time comes. Thanks again. Thanks for your comment and support. It’s amazing how much this injury has humbled me and made me appreciate some of the things that we take for granted. I feel very lucky and fortunate to be PWB at this point and am not going to push it. I don’t want to do anything to set myself back. I hope your appointment goes well and happy healing. I am almost 6 weeks post ATR and I am NWB and have swelling if I don’t elevate my foot. I think that it is fantastic that you are PWB after only 3 weeks. Good for you! I see my OS on Monday and I hope that I can go PWB after that because I am ready! I like your Doc’s advice OK. But when you’re removing a serve, I’d do it at bedtime and sleep in the boot that night. Lets your leg get used to the new angle before you load it up. juan63’s AchillesBlog is proudly powered by WordPress and WPDesigner..